Sweetgreen's quinoa salad will be a new offering at the P Street store. Exclusive to the Logan Circle store (for now) will be a selection of seasonal soups and a "Market" menu featuring three lettuce-less salads made with seasonal ingredients. Here's the recipe for one of those featured salads. Add water and quinoa to a saucepan and bring to a boil. Reduce heat and simmer for about 15 minutes. Quinoa is ready when the water has fully evaporated. Coat sweet potatoes with a half cup of balsamic dressing (see recipe below) and 1 tbsp of garlic salt. Lay out on a sheet pan. Bake for 15 minutes at 400 degrees. Sweet potatoes should be browned and crispy. Mix onions and mushrooms with 2 tbsp of oil and rosemary. Sauté in a large skillet over medium heat for 10-12 minutes. Mushrooms and onions should be crispy and darkened. 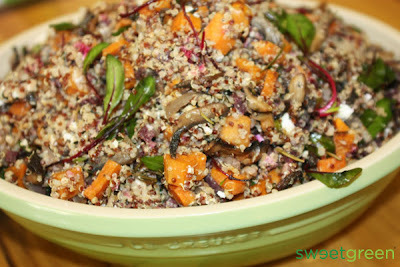 In a large bowl, combine cooked sweet potatoes, mushroom mixture and quinoa. Mix in goat cheese, garlic salt and 1 tbsp of olive oil. When fully mixed, add baby beet greens on top. Toss with balsamic yogurt dressing to taste. Place all ingredients in a bowl and whisk vigorously to combine. The mixture may separate as it stands; whisk before serving to restore consistency. Sweet Green in Logan was open today (Friday)!